There's been a lot of talk about the NSA and its data-gathering policies. The news sounds kind of scary. But you might be thinking that the NSA can't have literally every foreign and domestic call made in the U.S.. That would be a crazy amount of data right? Well, yes it would be, and it kind of seems like they have it. Or at least could afford to keep it if they wanted to. 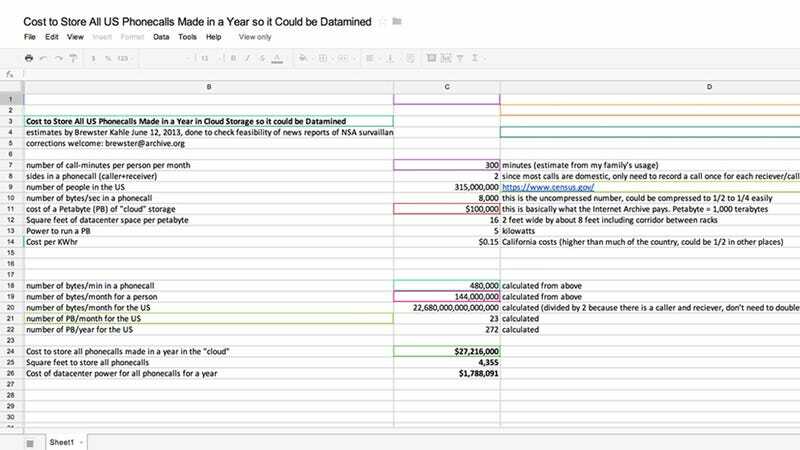 Brewster Kahle, one of the engineers behind the Internet Archive who has a good track record of not handing private user information to the feds, made the spreadsheet above to calculate roughly how much it would cost the NSA to store a year's-worth of comprehensive U.S. call data. And the number he comes out with is less than $30 million. Given that the NSA's estimated budget is $10 billion that sounds doable. Even storing years and years of call archives could be feasible.